Not to be confused with World 2-1, Level 2-1, or Stage 2-1. Area 2-1 is the first course of Jumpy Jungle and the tenth course overall in Mario vs. Donkey Kong: Mini-Land Mayhem!. It also introduces the Long Springs, a primary gameplay element which is used to bounce Minis across long distances. 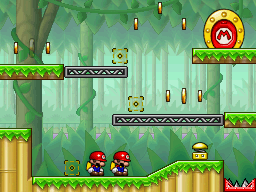 Both Mini Marios begin on a platform on the lower level, with the exit door on the top right. In order to reach it, they must simply be guided to a series of Long Springs leading to the top. The M-Token is located on the top left, atop a platform on the upper level. To collect it, the Mini Marios must simply use the Long Springs to reach the platform. The Mini Mario Card is located on the left, atop a platform on the middle level. The Mini Marios must be turned around to face left, and then a Long Spring should be placed leading directly to it. In order to earn a trophy, the player must score 15000 points. In Plus Mode, the Mini Mario must be guided to the exit door first, followed by the Mini Peach. This page was last edited on September 18, 2018, at 03:51.